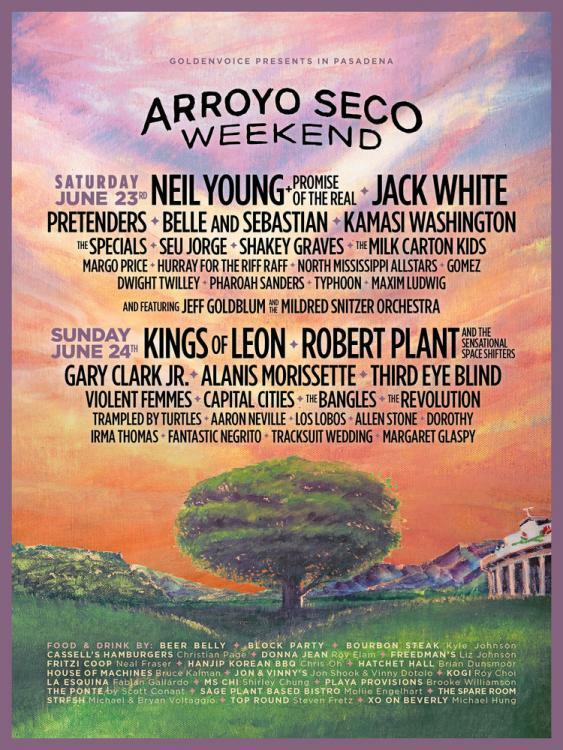 Courtesy of GoldenvoiceNeil Young and Robert Plant are among the artists set to headline the second annual Arroyo Seco Weekend festival, scheduled for June 23-24 outside of the Rose Bowl in Pasadena, California. Young and Plant will be playing with their respective backing bands, Promise of the Real and The Sensational Space Shifters, with the Canadian rock legend slated to perform on the first day and the Led Zeppelin singer on the second. The festival is the first announced live date of 2018 for Young. The Arroyo Seco bill also includes The Pretenders, The Bangles, Los Lobos, the late Prince‘s former group The Revolution, Gary Clark Jr., Dwight Twilley, Aaron Neville, U.K. ska veterans The Specials, jazz great Pharoah Sanders, and Violent Femmes, among many others. Ex-White Stripes frontman Jack White and Kings of Leon also will serve as headliners, respectively, on the first and second day of the fest. The two-day extravaganza also features curated food and wine offerings from a variety of Los Angeles chefs and restaurants, a children’s museum, local art and more. General admission and VIP tickets will go on sale to the public on March 9 at 10 a.m. PT at ArroyoSecoWeekend.com. Pre-sale passes will be available to American Express Card members starting Wednesday, March 7, at 10 a.m. PT.